I’ve been fortunate throughout my life to have clear skin. A breakout here and there? Sure. However, there wasn’t a time in which I felt the need to use anything more than water to splash my face off or layer on the lotion. Now that I’m getting a bit older, I’m starting to think about maintaining the beautiful skin that I’ve been blessed with. Sometimes it’s drier or duller than I’d like, and I want to stay my youthful self. I can’t write a post about skincare without mentioning my three essentials for healthy skin: water, food, and green juice. I drink anywhere from 1/2-1 liter of water when I wake up every morning, and I drink more throughout the day. It helps to keep my body hydrated and my skin supple. Eating water-rich fruits and vegetables and other nutrient-dense plant foods (including healthy fats!) deliver nutrition to your body’s cells, and that includes your skin. I rarely eat refined sugar, refined flours, and fried foods, but I do notice that those are the times that my skin decides to break out. It’s likely that if you pay close enough attention, you’ll notice your skin is not the only body part that gets angry with these foods. And of course, juice. I can’t say enough good things about the mighty green juice. If you’re not doing it, give it a go. It’s been so magnificent for my skin. That’s all well and good, but there are external factors that affect our skin, too, like pollution, cold and brisk winter weather, stress, lack of sleep, etc. Since I am caring so much about my body from the inside, I want to care for it on the outside, too. I’ve found some really fantastic natural products that continue to improve my skin the more I use them. My skin is literally glowing in appreciation. As far as my nighttime/daytime facial routine, I have been using 4 products fairly consistently. 2 of them are samples that I received in my Petit Vour boxes and the others are what should be essentials in everyone’s medicine cabinet. Below, you’ll see the line-up. I start off with the S.W. Basics cleanser. It’s a non-foaming cleanser that you apply with a cotton ball and wash off. It contains only rose water, vegetable glycerine, and tea tree oil. Using this product alone is enough to make my face look lively and feel as soft as a baby’s bum. I love the simplicity of the ingredients, and I will be buying a full size when I run out of this one. I then tone with witch hazel. 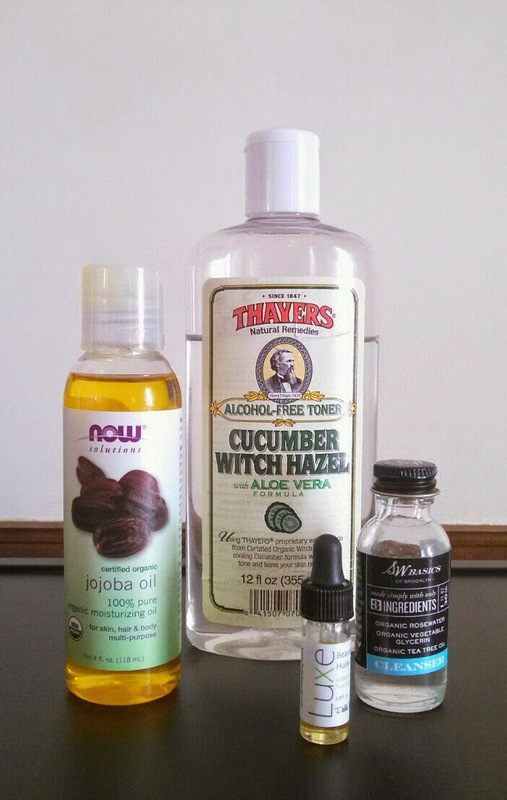 I initially bought witch hazel because it’s so versatile, but I didn’t have any one particular use in mind. I knew it would come in handy though. It’s a lovely toner. I was also relieved beyond belief when I found out it soothes hives. I had an allergic reaction this Jan. to a supplement I was taking, and I was slathering it all over. It was awesome. I bought this cucumber scent because I thought it would be refreshing, but I’m not so into it. When I finish this bottle, I’m going to repurchase this brand but in the rose scent. The final step, moisturizing, has been brilliantly performed by organic jojoba oil. I’ve used coconut oil for some time on my face and body, but I really like how quickly the jojoba oil sinks into my skin. Even though I went for the organic jojoba, it was relatively inexpensive, especially given that I only need to use a few small drops. While I use this mostly for my face, I’ve used it as an all-over moisturizer, and it’s great for my cuticles and as a makeup remover. While I use jojoba oil at night, I love to apply Pelle Beauty’s Luxe oil to moisturize my face in the mornings. This is another item that I received in a Petit Vour box. It’s their anti-aging and skin-soothing formula. The fragrance is beyond amazing. That alone can make me feel ready for the day. What it does to the skin is something special. When I first started using it, I couldn’t stop grazing my hand over my face because it felt so soft. When I run out of this one, I’d like to try their Stellar Multi-Tasking Facial Oil because that one is more affordable for me, and I love to have multi-use products. 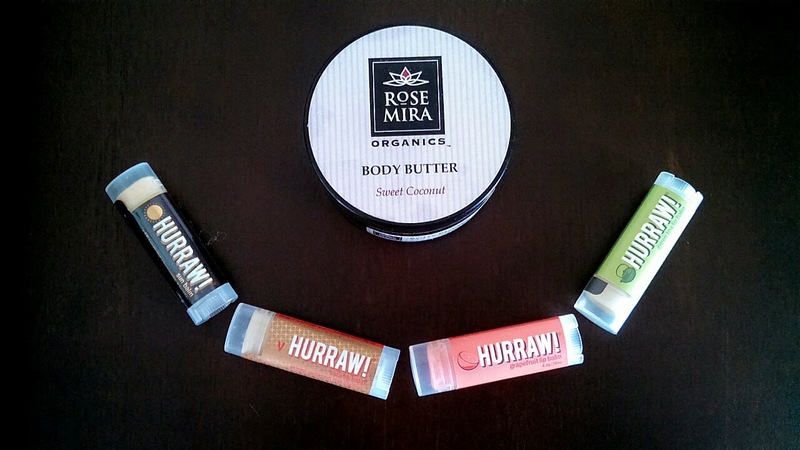 For my lips, I always have a tube of Hurraw lip balm on me. The flavor I choose depends on how I’m feeling that day, but lately I’ve been reaching for the green tea, grapefruit, or vata (almond cardamom rose) during the day. At night, my one-and-only is the sun balm (tangerine chamomile), and I do use it during the day, too, because it has SPF. The chamomile is really soothing and the citrus scent is just enough help me fall asleep happy. When I got Rosemira Organics sweet coconut body butter in a Petit Vour box, I said that it would be a scent that would help my mood through the dark, cold Pittsburgh winters. So naturally I included it on my Christmas list, and Santa delivered! My skin loooooves this stuff. I use it mostly for my hands and elbows and for my legs after I shave, but I’ve also used it on-the-go as a lip balm (in case my Hurraw is missing which happens sometimes!) and to moisturize my eyebrows and corners of my mouth when the bitter winds hit. I like having the small sample size from my Petit Vour box because I can throw that one in my purse and keep the other one at my bedside. Do you have any new or tried-and-true vegan beauty skin care favorites?